It was a Saturday afternoon in the middle of February – one of the last free weekends before the new AFL home and away season rolled around. Cam Rayner was sat perched by the banks of the Noosa River, joined by teammate Alex Witherden and a few more of the pair’s close friends. The group spent hours merely chatting – not about footy – and snacked on the cheese and cabana platter that lay before them. For Rayner and Witherden, this wasn’t an anomaly. It was common practice. The pair frequently make the trip north to Noosa where they just escape, sometimes by doing nothing at all. Even since resuming preseason training following the Christmas break, Rayner had been to the same Airbnb at least four times. A cheese platter and good company is simply how Rayner unwinds, removing himself from the constant rigours of a professional footballer as he enters his sophomore season in the AFL. “Being in Brisbane, you’re always in at the Club or always training so when you get those four-day breaks, the most important thing is to shut yourself down a little bit,” Rayner told aflq.com.au. “Even the other day, we probably sat there for about three hours doing nothing and just relaxed. SECURE YOUR TICKETS TO SATURDAY'S ROUND 1 CLASH AGAINST THE EAGLES! Despite his young age of just 19, Rayner appears different to many of the league’s younger contingent. While most might ponder what they can do to improve on the field while they’re away from the Club, the former number one draft pick almost makes it his mission to do exactly the opposite. And in doing so, Rayner hopes to unlock the secret to a long career in the sport. “When I’m in here (at the Club), I’m dedicated and switched on but when I’m away from the Club I’m usually pretty care free. I usually just shut myself out from footy and try and like a bit of a normal life,” Rayner said. Noosa remains the preferred escape for both Rayner and Witherden if the time permits, it’s where they have developed a knack for paddling on either a kayak or stand up paddle board. The trip has become somewhat of a ritual for them and even more so when they’re joined by housemate Eric Hipwood – the ‘boss’ of the Sunshine Coast, according to Rayner. But Rayner has other outlets too and in the 16 months of living in Queensland since being selected by the Lions in the 2017 NAB AFL Draft, he’s learnt of the many hidden gems littered around the river city. One of those has seen him become the resident movie buff at the Gabba and with two cinemas in close proximity to his house, it’s easy to see why. So much is his love of the cinema, he frequents the local movie theatre as much as two times a week, watching everything from civil rights dramas to biopics. While it may appear a near obsession on his behalf to distance himself from the sport during his downtime, it’s hard to argue that Rayner’s mindset isn’t achieving results. Despite the pressures that come with being the incumbent number one pick in the draft, Rayner flourished in his maiden season. He was one of only two rookies, the other being NAB Rising Star winner Jaidyn Stephenson, to feature in all 22 of their team’s games and ranked fifth among all players aged under 20 in AFL Player Rating points per game. He also picked up a NAB Rising Star Nomination in Round 15 and went on to finish seventh in the award last August, pipped by only a handful of his peers which included housemate Witherden who has almost mirrored Rayner’s off-field regime. Rayner chats with Harris Andrews during training on Thursday afternoon. After arriving at the Club, Rayner first stayed at Lions CEO Greg Swann’s house before moving in with former Lion Tom Bell. But following Jarryd Lyons arrival at the Club in early November, Rayner made the move to the vacant room with Hipwood and Witherden, left absent by Corey Lyons, who moved in with brother Jarryd. Sharing a passion for cricket, the five of them have orchestrated a competitive series of backyard cricket, often dominated by the crafty ability of the Lyons brothers both at the crease and in the field. And while it may appear a game of backyard cricket is just another way for Rayner to unwind away from the Gabba, the competitive nature of five men in their early and mid-20s often results in an outcome far more intense. “When you take that wicket, there’s a little bit more feeling in it,” Rayner joked. Rayner’s connections and relationships with many of his teammates speaks in large part to the culture developing at the AFL’s most northern Club, despite that temperament rarely translating to the backyard cricket pitch. While the team still boast the second youngest playing group, who also rank 17th in AFL experience, the 2019 playing list is full of of lively personalities who feel comfortable with one another while they continue to learn and develop. Rayner himself has even noticed a difference in the perspective between his first and second year with the group. Questions from the media are often positioned more broadly, encapsulating the whole team instead of focussing on sole players as had been the case for many years prior. Rayner celebrates with teammates after the Round 17 victory over Hawthorn in Tasmania. Brisbane host the reigning premiers West Coast to kick off their Toyota AFL Premiership season this weekend. For the Lions, the opportunity to test themselves against the competition’s best is a gift from the AFL’s fixturing gods. “All of the boys are keen to crack into the season. 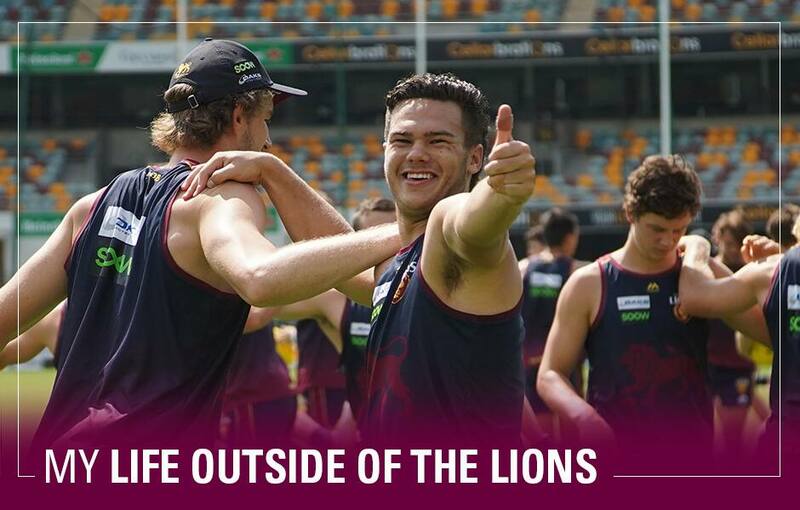 I think we’re all pretty happy that we get to play West Coast at the Gabba,” he said. Yet while the focus is very much on the Lions’ season opener this Saturday night, Rayner can’t help but look a little further ahead to another fixture that players and fans alike are also anticipating. “I think we’re starting to build a bit of a rivalry with Collingwood, especially from last year.